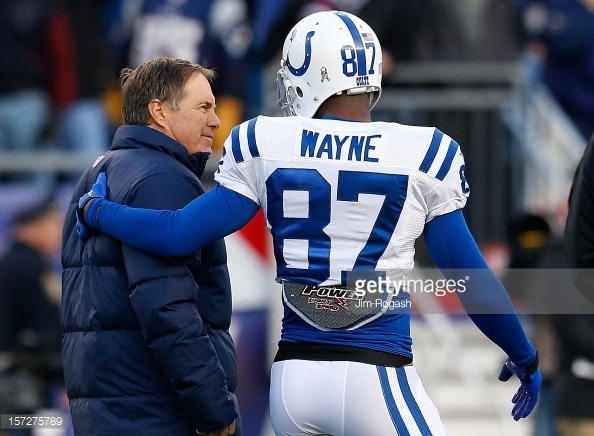 New England Patriots: Reggie Wayne and Other Thoughts | NFL News, as it happens, when it happens. Your one stop shop. The Reggie Wayne signing means a few things. First, the Pats aren’t satisfied with the depth at the position. With the starting three players (LaFell, Edelman and Amendola) all nursing injuries, Wayne comes in and add some quality depth. Yes, he isn’t the player he used to be, but he’s smart and knows how to run routes, which is essential in the Patriot offense. With the Jordy Nelson injury, it’s safe to say that if he would have left New England without a contract, he would be quickly snatched up by the Packers or another WR needy team. With Aaron Dobson still enigmatic and two WR put on IR on Monday (Brandon Gibson and Brian Tyms), Wayne can step in and help right away. With promising undrafted WR Chris Harper showing some great signs in these two games, everything behind him is a question. Wayne can be a reliable stop gap while they identify the players who make this offense click. at the Mercedes-Benz Superdome on August 22, 2015 in New Orleans, Louisiana. With James White and Dion Lewis both showing a lot of promise as the passing back, the Pats could be facing some tough decisions. Who will be the winner here? The money is on White due to spending a 4th round pick on the player, but Lewis is looking like the player that he should have been when he was drafted by Philadelphia a few years back. 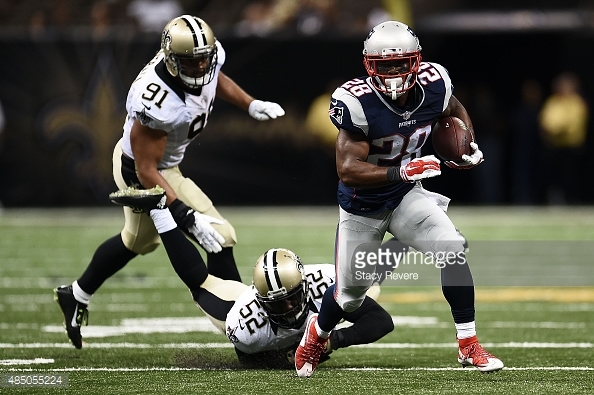 If they keep him, that means they will keep 6 RB’s (Blount, Gray, Lewis, White, Boldin and Develin as a FB). That’s a lot dedicated to one position, but this is something to keep an eye on. The winner will go to the one who is best at pass protection. To say the defense was underwhelming against New Orleans is an understatement. Even without Jerod Mayo and Dontá Hightower in there, Brees picked apart the first team defense. With 7th rounder CB Darryl Roberts facing a potential season ending wrist injury, the depth behind Malcolm Butler, Logan Ryan and Terrell Brown is rather disconcerting. Expect another addition here as the coaching staff figures who is going to make the team. Let’s hope for everyone’s sake that the Devin McCourty time back at corner was as short lived as it was. He isn’t the answer and it might take a few more weeks until they find that out. 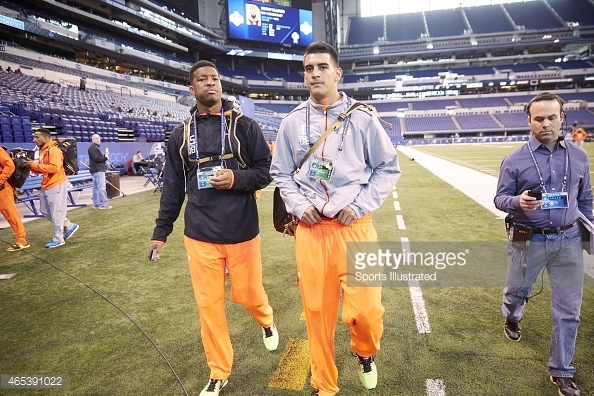 Football: NFL Scouting Combine: (L-R) Florida State QB Jameis Winston (QB15) and Oregon QB Marcus Mariota (QB11) on field before drills at Lucas Oil Stadium. The teams that picked one and two in this draft are in a rather interesting predicament. Tampa Bay drafting Jameis Winston and Tennessee drafted Marcus Mariotta means that they set at quarterback (for the time being). Their backups are where it gets interesting. QB Zach Mettenberger has been lights out in these two preseason games for the Titans and QB Mike Glennon has looked very good in his playing time playing after Winston in Tampa. With teams facing some rather horrible QB play (Washington and Buffalo come to mind), you might see these quarterbacks go for a nice price. The Drew Brees/Phillip Rivers situation comes to mind. In Brees’ first 3 years in San Diego, he was underwhelming and was inconsistent, prompting the team to draft Eli Manning and then ship him off to the Giants for Phillip Rivers. Somehow, that turned the light on for Brees and his play took off after that. A similar situation could be going on in Tampa and Tennessee. It’s definitely something to keep an eye on.